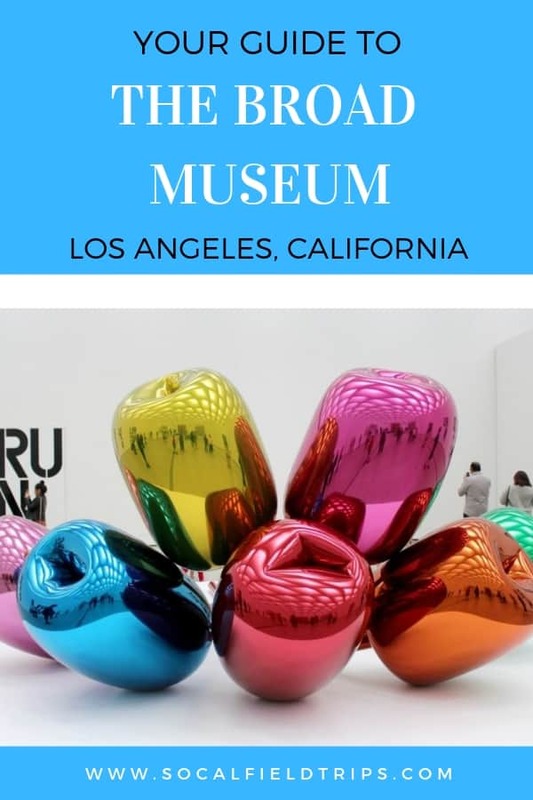 Earlier in 2018, my family and I traveled to LA to visit a few attractions, including The Broad on Grand Avenue in downtown Los Angeles. 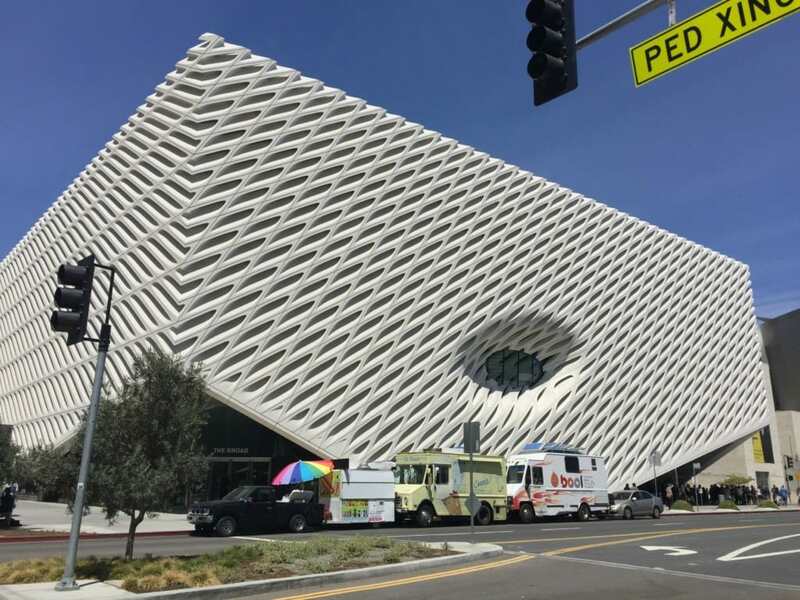 Founded by philanthropists Eli and Edythe Broad, The Broad Museum is home to more than 2,000 works of art, which is among the most prominent holdings of postwar and contemporary art worldwide. Designed by Diller Scofidio + Renfro in collaboration with Gensler, the three-story museum features 50,000 square feet of column-free gallery exhibition space divided between two floors. 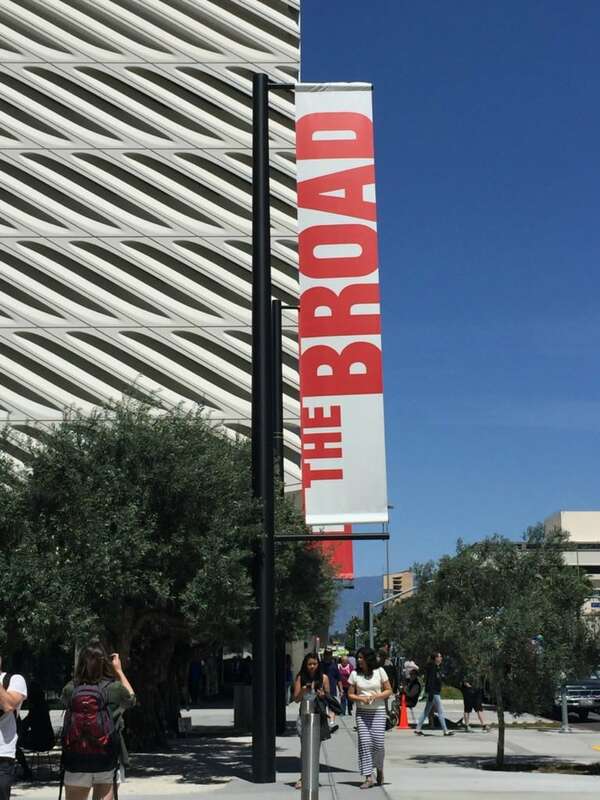 The Broad offers free admission to the general public. Advance admission tickets are often fully booked, but an onsite standby line is available at the museum every day except Mondays, when the museum is closed. The expected wait time is between 2-3 hours if you decide to wait in the standby line. 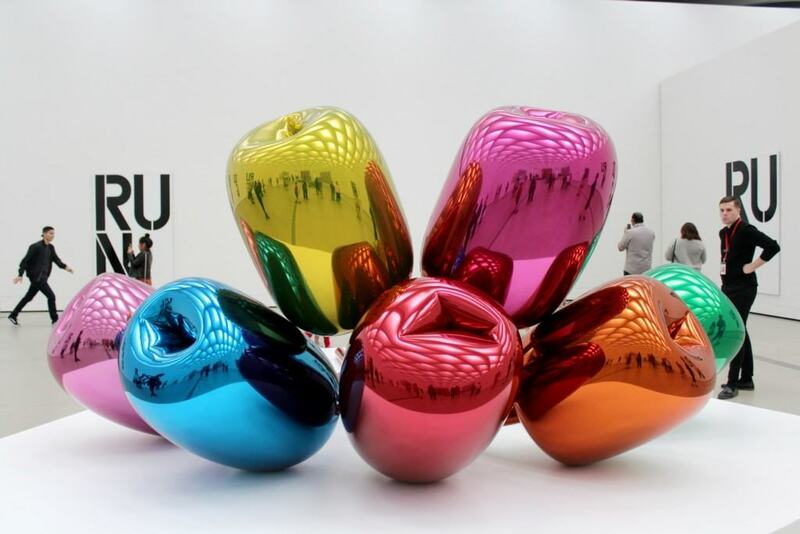 Right from the start, you will notice a few unusual pieces of art in the lobby. 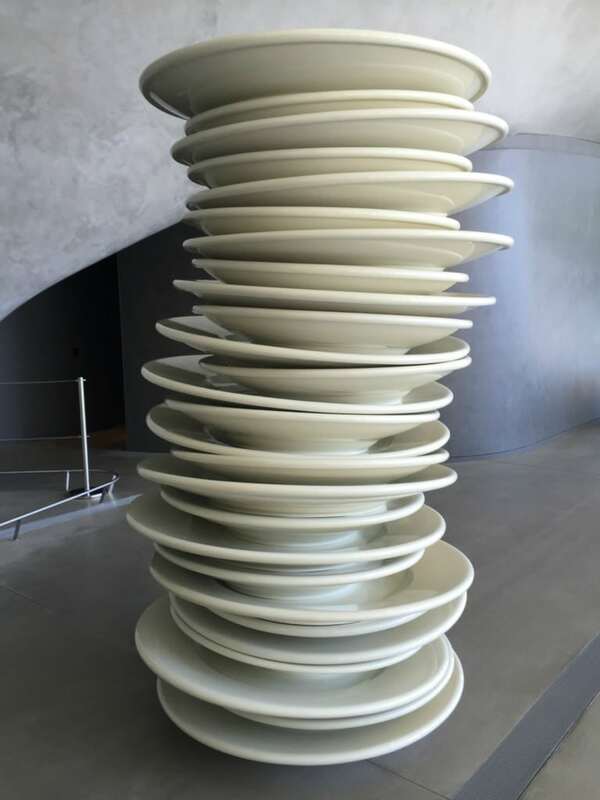 Like this gigantic stack of plates by Robert Therrien made out of ceramic epoxy on fiberglass. After exploring the lobby, my family took the escalator to the third floor and worked our way down. 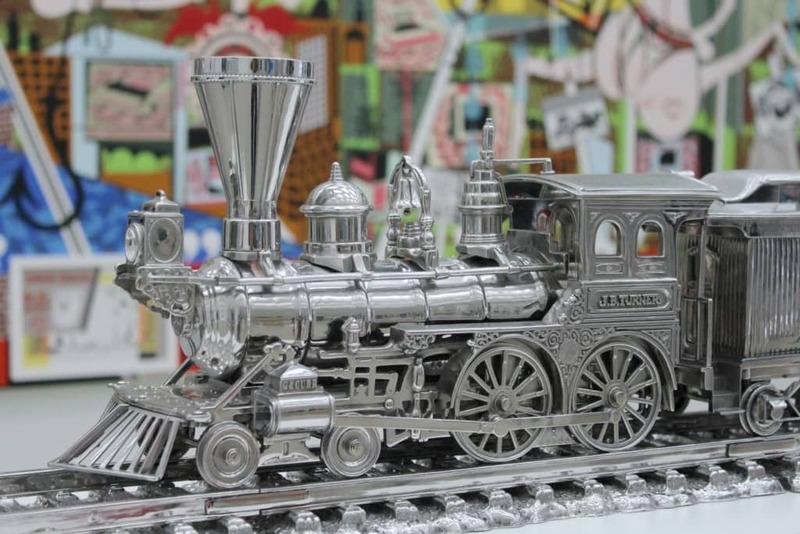 We observed numerous pieces of life size art on every level like Jeff Koons’ Tulips, Jim Beam — J.B. Turner Train, Michael Jackson and Bubbles and Balloon Dog (Blue). 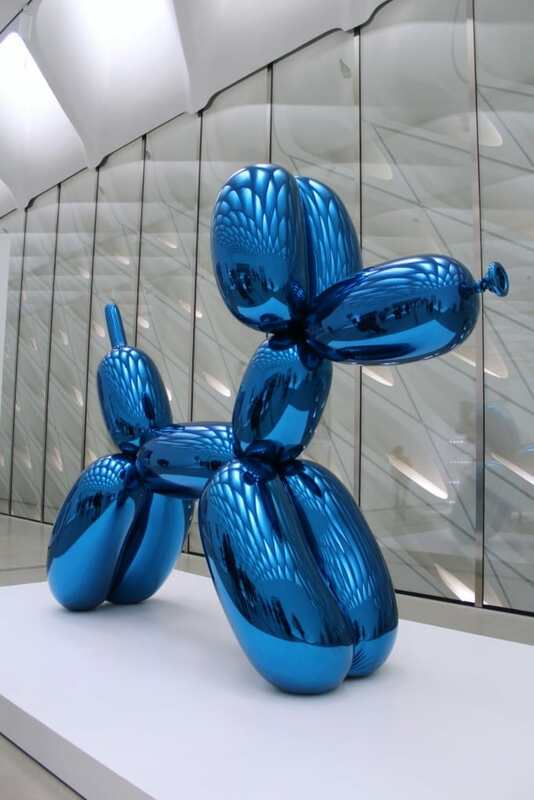 As part of Jeff Koons’s Celebration, an ongoing series of paintings and sculptures that memorialize the rituals, icons, and images surrounding birthdays, holidays, and other party occasions, Balloon Dog (Blue) may be the most imposing work. 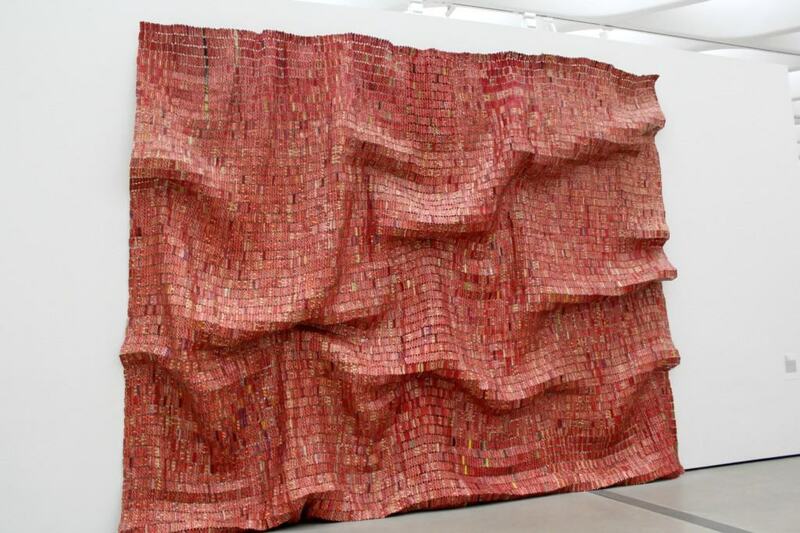 Other points of interest at The Broad include El Anatsui’s Red Block made out of found aluminum and copper wire and Robert Therrien’s Under the Table, a giant table and chairs. 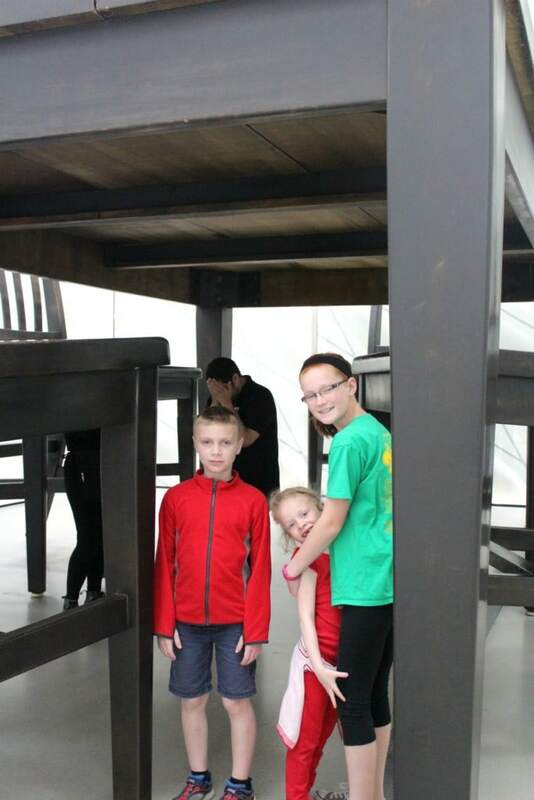 Under the Table is the perfect location for the whole family to gather and take a picture. So make sure to bring your camera along! Another quite peculiar piece of artwork, Charles Ray’s Fall ’91, depicts a woman standing with her weight mostly on one foot in a common contrapposto pose. 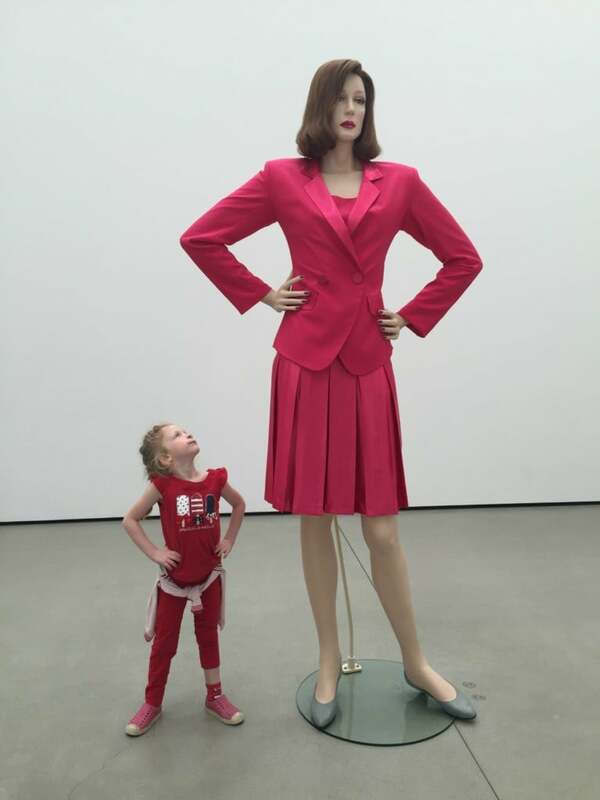 Modeled on a mannequin scaled to eight feet tall, the sculpture looms large in a pink power suit fashionable in the fall of 1991. Field Trip Girl looked like a little peanut standing next to the model! By far, my favorite installation of all was Iceland’s Ragnar Kjartansson called The Visitors, in which he filmed and recorded musicians in various rooms in an upstate New York house, all playing a piece of music (depicted on nine screens) and eventually ending up in the same room. 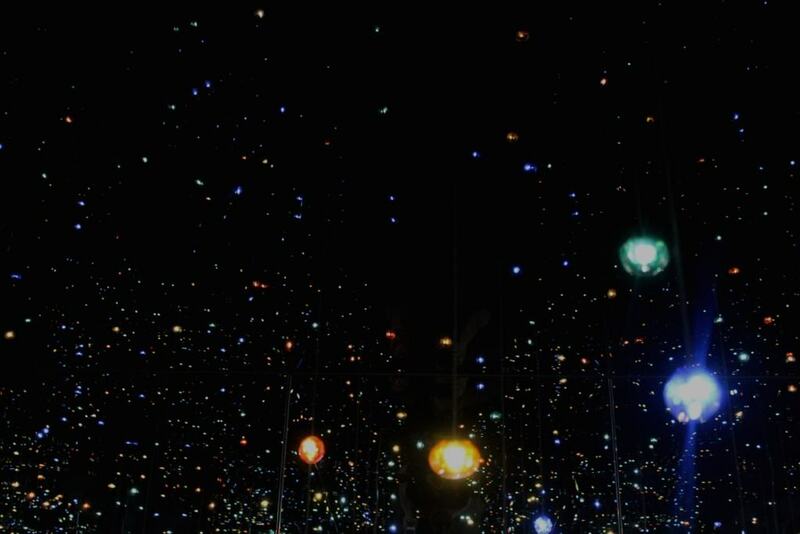 It was simply mesmerizing! 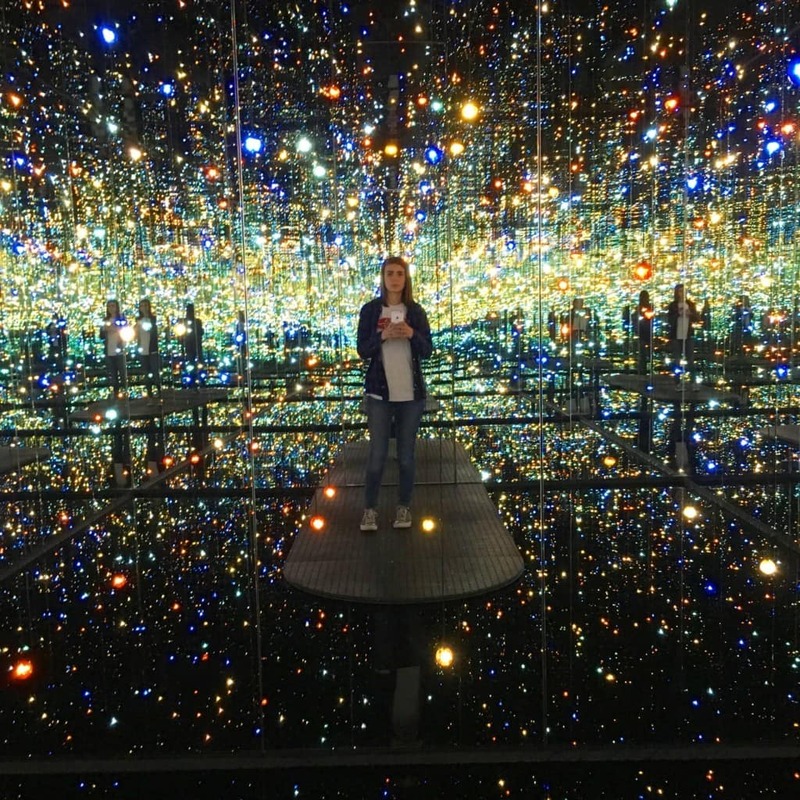 On view on the first floor of The Broad is Yayoi Kusama’s Infinity Mirrored Room, a mirror-lined chamber housing a dazzling and seemingly endless LED light display. 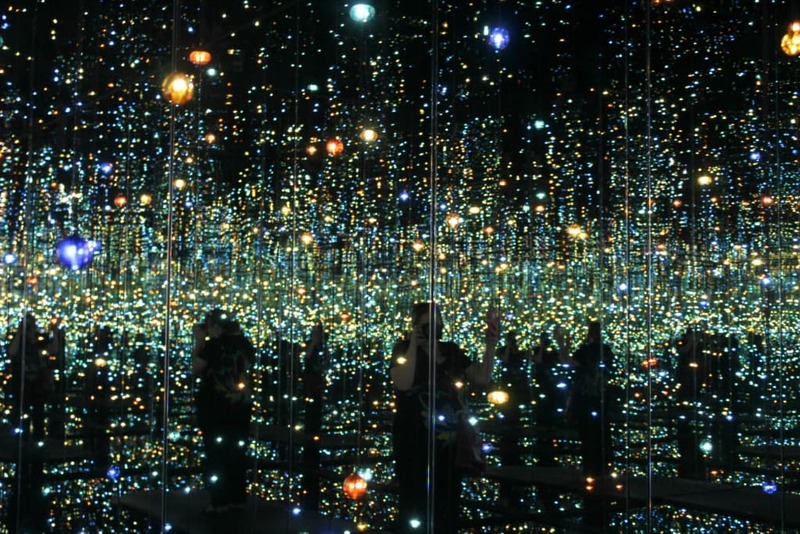 The Infinity Mirrored Room can only accommodate one visitor at a time for about a minute, and requires a separate free timed same-day reservation which ticket holders are able to reserve, pending availability, after arrival into the museum. Reservations usually book up early in the day. The Broad is open every day except Mondays, and you may request a self-guided group visit anytime during normal operating hours. Reservations must be made at least two weeks in advance of your visit date. 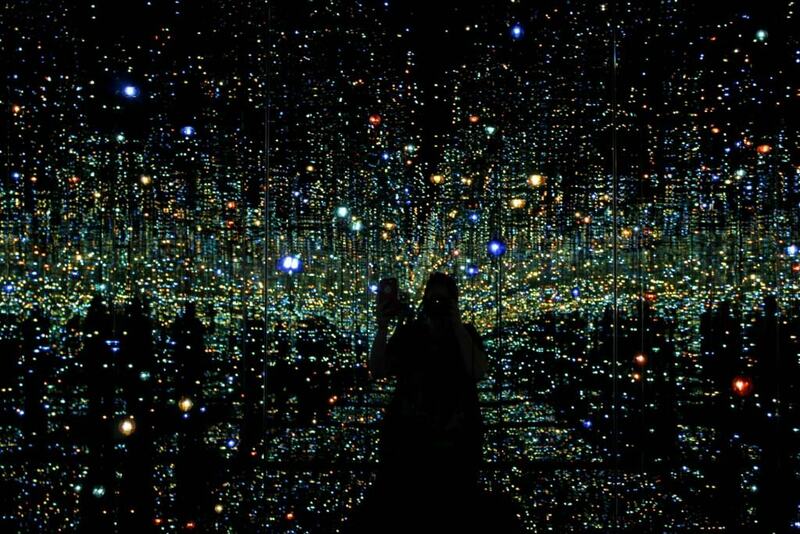 Self-Guided Group Visits cost $5 per person. A minimum of 10 people is required to book a tour. If your group is fewer than 10 guests, a base rate of $50 per group is required. The Broad’s Family Weekend Workshops offer families with children ages 3 and up with activities and workshops that engage the art and architecture of The Broad museum. Workshops are presented bilingually in English and Spanish and give families the opportunity to make their own creative souvenirs to take home inspired by the Broad collection. 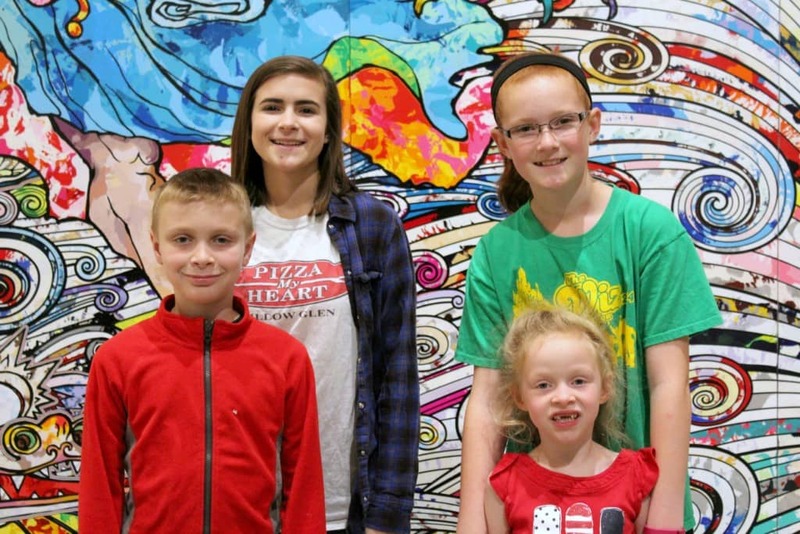 Family Weekend Workshops are FREE, but have limited availability and entrance is not guaranteed without a reservation. I recommend signing up for their newsletter to find out when reservations are open for the next Family Weekend Workshop. Looks cool. 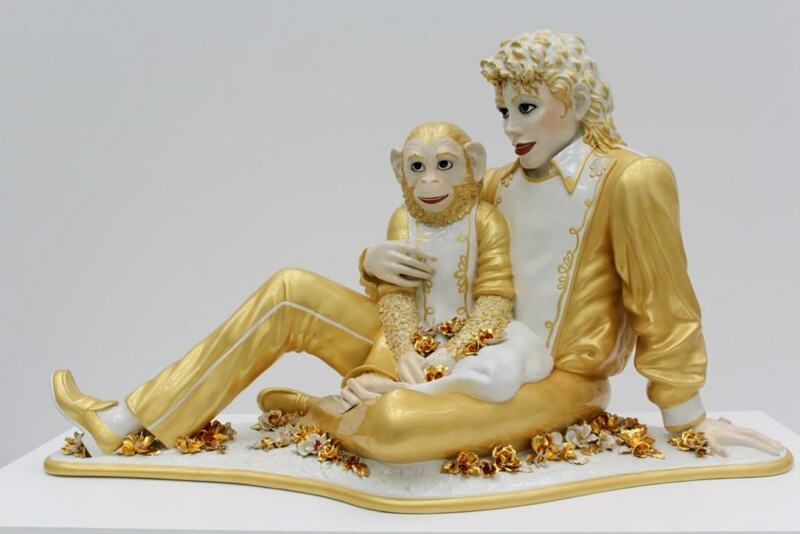 Great you’re exposing your kids to culture. I wrote you on Facebook I have plans to go.